This book was a library loan. Yay libraries! I read this book a while ago, and then I forgot to review it. So, I’m making up for lost time here. I apologize for taking so long, but life happens and here we are. Better late than never, right? 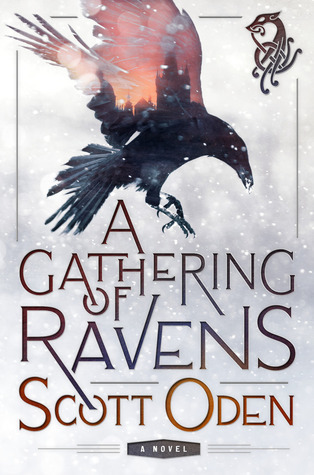 A Gathering of Ravens is the sort of book that’s right in my wheelhouse. It’s a fantastic take on myth and history that has just enough real-world woven in to capture my interest. I really love books that make me wonder how much research must have gone into writing them, and this is one of those. The thing is, when an author puts so much effort and research into writing a book, I can tell, and I like that. It means the world is coming to life for me, and the tale being told is relevant and captivating enough for it to transform from a story being told to me, into something I feel like I’m experiencing. I hope that makes some sort of sense. What I’m basically saying is, this book felt real while I was reading it, and the ability to make that happen must have taken just a stunning amount of research and effort on the writer’s part and that really needs to be recognized. The ability for Oden to so perfectly capture the atmosphere and cultural aspects of a time so long ago was nothing short of remarkable, and really turned out to be one of the primary strengths of this novel. This book is ultimately one about change, and shared journeys, relationships and all the things that entails. A confounding confluence of events results in the capture of one person and then a harrowing a journey from the hinterlands of Denmark to a land across the sea in a quest for vengeance. The world has changed, and things aren’t as they seem to be. Together these people thrust together by circumstance, must make peace and navigate a world they don’t really understand, one where they are both on the fringes of status quo. Throughout all of this, Grimnir and Étaín end up turning from people at odds with each other, to their own support and ally in this strange new world they find themselves in. What I really loved about A Gathering of Ravens was the fact so many details were touched on. I’m a sucker for details, but Oden really put his all into them, and it showed. Throughout this saga, readers are confronted with some of the ugliness of the times, what happens when cultures clash, when religious devotions change from paganism to belief in the Christ, the ugliness of wars, tragic injustices, and other things of that nature. It’s not an easy world, and the dense writing and vivid prose really brought it to life, from the cold chill which I could almost actually feel, to all these horrors. This is not a light book, not by any means. It’s dark, and it’s full of tragedy and passioned battles of both the personal and the sharp-pointy-ended kind, but my god, it was well done. The fantasy elements were wonderful. Oden injected his story with magic and lore, like Celtic faeries, for example, and details from legends that have peppered the history of many of those older places of yore. There are also orcs, and dwarves, and other fantasy creatures like that, as well as magic. This flawless blending of magic, myth, and history was, quite frankly, captivating. I really love historical fantasy, and this right here is why. It’s really fun to read a book based on such a strong foundation, and then see just how the author took that foundation, and turned it into something else entirely. I loved the relationship that forms between Grimnir and Étaín. It started out fraught and difficult, but through time it evolved into something else. Each character took on a life of their own and, like the world they inhabit, nothing is as it seems to be. Oden has a gift with delving below the surface, and forcing his readers to do the same. Things might be ugly, and they might be dark, but under it all is a core there is light, and there his hope, and there is tomorrow, and it is worth fighting for. Tense, atmospheric, and vividly written, A Gathering of Ravens is one of those books that has been underappreciated, too overlooked, and not received nearly the attention it deserves for the incredible work that it is. If you’re a fan of historical fantasy, and you haven’t read this yet, you’re really doing yourself an injustice. Oden infuses this book for the passion of his craft, and love of the subject he writes about. I can’t remember a time I’ve been as excited to a read a book as I am to read A Gathering of Ravens after this review! I always get sucked in by a good cover, but I’m happy I did because this book sounds right up my alley.